Born in Brockton, Massachusetts, Holmes left school at age 13 upon the death of his father. He apprenticed himself to a printer and provided the entire support for his mother and siblings. Holmes graduated as a journeyman printer at age 18. When the Civil War erupted, Holmes entered military service as a private in the 35th Regiment of Massachusetts Volunteer Infantry despite his persistent health issues. Throughout the Civil War, Holmes’ illness compelled him to leave the fields of battle, but he continued to return when his health was restored. Holmes was present when President Lincoln reviewed the Army of the Potomac after the Maryland campaign of 1862. Holmes received a lieutenant’s commission by the end of the war. After the war, he obtained a foreman’s position on the Randolph Register, a paper he successfully managed. Next, he was offered a partnership on the Brockton Gazette in his hometown of Brockton. The business was successful, but consumption took the lives of his mother’s family and doctors encouraged Holmes to seek a different climate. Arriving in Southern California in 1874, he held a foreman’s position at the Los Angeles Herald office, until he settled in Riverside in April of 1875. Holmes purchased a 25-acre tract in Brockton Square on Brockton Avenue near Jurupa Ave. This was near other townsmen who had relocated to Riverside from Brockton, Massachusetts. Brockton Avenue was later given its name out of compliment to them. Holmes focused on farming and civic affairs. Perhaps his greatest contribution to the community was principal organizer of the Riverside Library association in 1879. Holmes planted a variety of trees and vines and raisins and was part of a committee of horticultural “students” who gathered to evaluate the qualities of the first Riverside oranges in comparison with specimens from Europe and Florida. From these tests, the Riverside grown navel orange was determined to be the best in the world. The soil and climate were unequalled for producing citrus fruits. The outcome of this was the creation of citrus fair associations that aided in the horticulture development in California. Holmes help represent Riverside at the great citrus fair held in Chicago in 1886. This influence helped start the great immigration movement to Southern California. Holmes also represented Riverside at an exhibit in New York that enabled Riverside citrus to enter that wide market of distribution. In 1884, Holmes was chosen to fill a vacancy on the Board of City Trustees. He was reelected and served as a chairman. 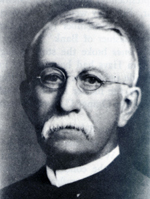 Holmes also was chairman of Riverside’s “street ornamentation committee” for seven years. In 1889, a committee from the Riverside Woman’s Club began a letter writing campaign to Andrew Carnegie requesting library funding. Holmes wife, Alice was a founding member along with Dr. Sarah Maloy and Mary E. Boggs. Holmes served on the Board of Library Trustees with George H. Deere, Lyman Evans, and Albert S. White. The Woman’s Club request was denied. In 1901-02, Mrs. Alice Holmes was Woman’s Club President and Elmer Holmes was on the Library Board. Both worked with Mary and Lyman Evans to advance the cause of the library and on April 16, 1901, Carnegie awarded the Library Board $20,000 for a library building. Holmes and the Board helped select the plans for the original Carnegie library building. 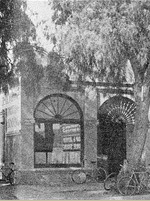 It was built in 1903 and was demolished in 1964, replaced by a new Main Library. By 1887 Holmes was managing editor of the San Bernardino Index, a morning daily paper owned by a syndicate of Republicans. He resigned and formed an association with R.J. Pierson and James H. Roe. They purchased two daily and two weekly papers in Riverside and consolidated and published them as the Daily Press and Horticulturist with Holmes as the editor in charge. After seven years, Holmes sold the papers to the Press Publishing Company, of which Ernest P. Clarke was president. Pierson, Roe and Clarke are also buried at Evergreen. Holmes was also involved in education, serving as an administrative officer and secretary of the school board since arriving in the 1870s. He was elected a school official when there was only one school in Riverside. He held the position of executive officer of the school board for over fifteen years. In 1890, he served in the role of superintendent. Holmes organized the Riverside High School, and authored the Union District High School law, which allowed single districts or combinations of small rural districts to provide preparatory schools enabling children to be educated at home. Holmes was elected assemblyman in 1888, for San Bernardino County as Riverside County had not yet been established. In 1893, Governor Pardee appointed Holmes to fill a position on the Board of County Supervisors. He was re-elected three times, remaining there until his death in 1913.